One of the most powerful Lean Manufacturing Tools and a cornerstone of any successful implementation is that of 5S, but what is 5S and its 5 Steps of Seiri, Seiton, Seiso, Seiketsu and Shitsuke? Most of the other definitions of 5S and descriptions that I see here on the internet concentrate heavily on the aesthetics and the efficiency gains that you achieve through implementing 5S and neglect the real aim of 5S; the need to introduce standard operational practices to ensure efficient, repeatable, safe ways of working. In addition to standardized working which provides you with a stable foundation to build all of your other improvements through implementing Lean Tools, you also provide a highly visual workplace. One of the most important factors of 5S is that it makes problems immediately obvious. 5S is a team run process and should be conducted by the people who work within the area in which the principles of 5S are being applied, it is not a tool that can be applied by an outsider onto an area without the knowledge and cooperation of the people within it. Frank Gilbreth showed that by improving the ergonomics of a bricklayers working methods he could reduce the number of individual movements required and increase the hourly output from 120 to 350 bricks laid each hour. 5S is a methodical way to organize your workplace and your working practices as well as being an overall philosophy and way of working. It is split into 5 phases, each named after a different Japanese term beginning with the letter “S”; (Seiri, Seiton, Seiso, Seiketsu, Shitsuke) hence the name 5 S.
And for completeness, some companies add a 6th (6S) of Safety, although in my opinion this should be an integral part of the steps of 5S and not a separate stage in itself. There has been reluctance for some companies in the past to take up “Japanese” initiatives for business improvement, so some consultancies and other bodies have come up with non-Japanese equivalents; two of which are listed below as alternatives for 5S. • Good workflow -> Achievement. • Outlining tools on a tool board. • No gradual decline back to the previous way of operating. 5S Seiri or Sort is the first step in 5S, it refers to the sorting of the clutter from the other items within the work area that are actually needed. This stage requires the team to remove all items that clearly do not belong in the working area and only leave those that are required for the processes in question. 1. Only the required paperwork is present at the workstation. Out dated or otherwise unnecessary posters, memos, announcements, reports, etc. are removed from the workplace. 2. Only the required equipment is present at the workstation. All obsolete, broken or unnecessary equipment, shelves, lockers, workbenches, etc. not required to make the current product is removed from the workplace. 3. Only the required furniture is present at the workstation. All broken or unnecessary chairs, shelves, lockers, workbenches, etc. not required to make the current product is removed from the workplace. 4. Only the required spare parts, materials, WIP, etc. are present at the workstation. Items not required to make the current product are removed from the workplace. 5. Only the required tools are present at the workstation. Items not required to make the current product are removed from the workplace. 1. Paperwork is properly labeled and has a clearly defined and labeled location that is visible to the operators and away from work surfaces. 2. Equipment is clearly identified (numbered, named, color coded, etc.) and placed in a properly identified location. Critical maintenance points are clearly marked. 3. Furniture is clearly identified (numbered, named, color coded, etc.) and placed in a properly identified location. 4. Locations for containers, boxes, bins, WIP, materials, etc. is clearly defined by painted lines and properly labeled (part number, quantity, etc.). 5. Tools have a designated storage location that is within reach of the operator. The location is properly labeled and tools can easily be identified if absent. 5S Seiso or Sweep is the thorough cleaning of the area, tools, machines and other equipment to ensure that everything is returned to a “nearly new” status. This will ensure that any non-conformity stands out; such as an oil leak from a machine onto a bright, newly painted clean floor. 1. Floors are free from dirt, debris, oil, parts, hardware, empty boxes, packaging material, etc. Drains (if required) are properly located and unclogged. 2. Walls, partitions, railings, etc. are painted and kept clean. 3. There is a schedule showing times, frequency and responsibilities to clean areas of the workplace such as windows, corners, walls, doors, top of cabinets, etc. 4. All cleaning equipment is neatly stored and is readily available when needed. 5. Containers, boxes, bins, etc. are clean and not cracked, torn, or otherwise damaged. They are neatly stacked. 6. Tools are kept clean and in good working order. 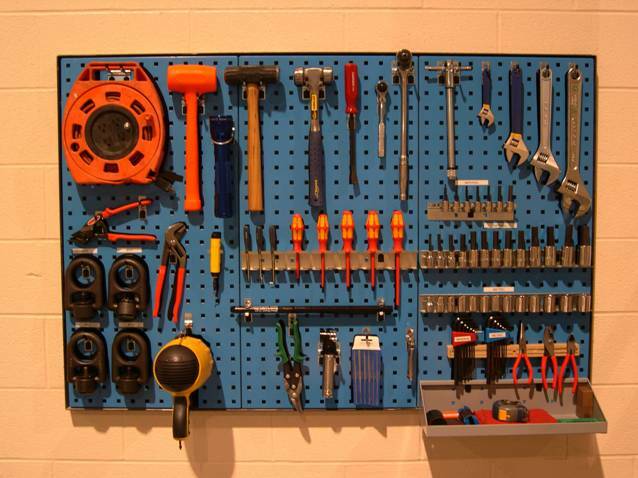 Where possible, tools are stored in a manner to keep them clean and free from risk of damage. 7. Paperwork is not torn, kept clean and protected from dirt. 8. Work surfaces (machines, workbenches, dies, and other equipment including electrical boxes) are clean and painted. 5S Seiketsu or standardize is the process of ensuring that what we have done within the first three stages of 5S become standardized; that is we ensure that we have common standards and ways of working. Standard work is one of the most important principles of Lean manufacturing. 1. Product waste (e.g. shavings, containers, liquids, wrappers, etc.) is consistently and often cleaned up and removed from the workplace. 2. Preventive measures have been implemented to ensure the workplace meets 6S guidelines (e.g. systems that do not allow waste to accumulate such as containers to collect product debris from machines). 3. The results of the previous audit are posted and clearly visible to the entire team. 4. Areas for improvement identified during the previous audit have been completed. 5. Tools, equipment, paperwork, furniture, etc. are stored neatly in designated areas and are returned immediately after each use. 6. Documents are labeled clearly as to contents and responsibility for control and revision. The date and revision number are clearly visible. 7. Equipment maintenance records are visible and clearly state when maintenance last occurred and when next maintenance is scheduled. 1. All operators, team leaders, supervisors, etc. are assigned 6S activities to be completed at least once/week. 2. The team took the initiative to make improvements to the workplace that was not identified during the last 6S audit. 3. A member of Management has participated in a 6S activity such as an audit or other activity within the past 3 audit periods. 4. Recognition is given to teams who get involved in 6S activities. 1. Equipment safety concerns are clearly identified. Safety guards are painted, in good working condition and provide adequate protection. 2. Stop switches and breakers are highly visible and located for easy access in case of emergency. 3. Tripping dangers such as electrical cables, etc. are removed from standing/walking areas. 4. Working conditions are ergonomically friendly. Tools are stored at appropriate heights; lift assist devices are provided where necessary, etc. 5. The work environment satisfies the requirements of the work being performed. Lighting (brightness and color), air quality, temperature, etc. 6. The workplace layout accommodates easy exit in case of emergency. 7. Walkways and vehicle paths are clearly identified and unobstructed. Exits are clearly labeled and unobstructed. 8. Work areas requiring personal protective equipment are clearly labeled. 9. All personal protective equipment is maintained in sanitary and reliable condition and is properly stored in an easily accessible and labeled location when not in use. 10. Fire hoses, fire extinguishers and other emergency equipment are prominently displayed and are unobstructed. There is a general appearance of a confident understanding, and adherence to the 5S principles. Information board shows root causes and action on metrics. Follow-through with 5S agreements and safety practices is evident. Meaningful metrics are visually part of information board. 5S agreements and safety practices have been developed and are utilized. Information board is present, visible, and maintained. A recognizable effort has been made to improve the condition of the workplace. Team members have knowledge of 5S. checks are randomly performed and there is no visual measurement of 5S performance. Everyone is continually seeking the elimination of waste with changes documented and information shared. Substantial process documentation is available and followed. Possible for visitors to tell what work is being performed and where in most cases. Working environment changes are being documented. Visual control agreements for labeling and quantity levels established. Methods are being improved but changes have not been documented. Hard for visitors to tell what’s going on, but employees know. Workplace methods are not consistently followed and are undocumented. Employees have devised a dependable, documented method of work area maintenance. Work area cleanliness and organization is a way of life. 5S agreements are understood and practiced continually. Work area is neat & organized, desk top items & files are labeled and readily available. Work/Break areas and equipment are cleaned on a daily basis. Visual controls have been established and marked. Work/Break areas appear clean on a regular basis. Key items to check have been identified. Workplace areas are dirty, disorganized, and key items are not marked or identified. A dependable, documented method has been established to recognize, in a visual sweep, if items are out of place or exceed quantity limits. Designated locations are marked to make organization more visible. Incoming and outgoing areas are clearly marked and utilized. A designated location has been established for items according to use. Items are randomly located throughout the workplace. Employees are continually seeking improvement opportunities. A dependable, documented method has been established to keep the work area free of unnecessary items. Unnecessary items have been removed from the workplace. Necessary and unnecessary items are separated. Nothing is placed on top of machines, cabinets, etc. Needed and not needed items are mixed throughout the workplace. Step1: Establish a 5S Promotion Organization There should always be some kind of organization in charge of promoting 5S implementation. This organization should be led by some of the plant/sites top managers and should operate plant/site wide. Step 2: Establish a 5S Promotion Plan 5S implementation is never-ending, but for the organization’s sake it is best to schedule implementation activities one year at a time. Step 3: Create 5S Campaign Materials Top managers should be involved in creating materials that enlist site wide cooperation n the site’s 5S campaign. Step 4: In-house Education In-house education is needed to answer the first question on everyone’s mind, “What does 5S mean?” It is also needed to teach the importance of the 5S’s or ensuring the plant’s long term survival. Step5: 5S Implementation 5S implementation activities are what firmly establish all five S’s in the site. Such activities include ”visual 5S’ methods such as red-tagging for visual Organization and the signboard strategy for visual Orderliness. Step 6: 5S Evaluation and Follow-up To prevent 5S conditions from deteriorating, periodic 5S evaluations should be initiated to check, maintain, and improve 5S conditions. Repeating steps 4 and 5 will also help improve 5S conditions. What to do who does it? 8. Do the red tag all persons? 1. Make a floor plan or area diagram of the study area. 2. Draw arrows in process flow sequence. For every operation there is one arrow. 3. Search for areas of waste based on principles shown earlier. 4. Make new 5 S maps. Draw arrows again. (Use several iterations till most efficient one is reached) 5. Find out the feasibility and time period to make the layout change. 6. Implement the new layout by moving parts, tools, machines etc. 7. Continue to further improve the layout. 1. Are there any tools, spare parts, materials left on the floor, nearby equipment? 2. Are all frequently used objects sorted, arranged, stored and labeled? 3. Are all measurement instruments/devices sorted, arranged, stored and labeled? 4. Does the inventory or in-process inventory include any unneeded materials or parts? 5. Are there any unused machines or other equipment around? 6. Are there any unused jigs, tools, dies or similar items around? 7. Is it obvious which items have been marked as unnecessary? 8. Has establishing the 5S’s left behind any useless standards? 1. Are access roads, storage areas, working places and equipment’s surroundings clearly defined? 2. It is understandable what the usefulness of all the pipes, cables is? Are these easy to be identified? 3. Are the tools/devices/instruments properly organized in two categories: “regular” and “special destination”? 4. Are all containers, recipients, pallets and NTMs stored in an appropriate manner? 5. Is there anything too close to fire extinguisher? 6. Does the floor have any cracks, drops or variation in level? 7. Are shelves and other storage areas marked with location indicators and addresses? 8. Do the shelves have signboards showing which items go where? 9. Are the maximum and minimum allowable quantities indicated? 10. Are white lines or other markers used to clearly indicate walkways and storage areas? 1. Check carefully the floor, the access roads and equipment’s surroundings! Can you find or notice oil stains, dust, fillings and waste? 2. Are there any parts from the machines/equipment dirty? Can you find or notice oil stains, dust, fillings and waste? 3. Are any supplying pipes/ belts greasy, dirty or cracked? 4. Is the draining system for waste and oils clogged (totally or partially)? 5. Is the lighting environment affected? Any dirty light bulbs or windows? 6. Are floors kept shiny and clean and free of waste, water and oil? 7. Are the machines wiped clean often and kept free of shavings and oil? 8. Is equipment inspection combined with equipment maintenance? 9. Is there a person responsible for overseeing cleaning operations? 10. Do operators habitually sweep floors and wipe equipment without being told? 1. Do you wear dirty or inappropriate clothing? 2. Does your workplace have adequate light and aeration? 3. Are there any problems regarding noise, vibrations and heat/cold? 4. Is the roof cracked? How about ventilation? 5. Do you have designated areas for eating and smoking? 6. Are improvement memos regularly being generated? 7. Are improvement ideas being acted on? 8. Are standard procedures written, clear and actively used? 9. Are the future standards being considered with a clear improvement plan for the area? 10. Are the first 3S’s (Sort, Set Locations & Limits and Shine & Sweep) being maintained? 1. Are you doing the daily cleaning checking? 2. Are the daily reports correctly done and in due time? 3. Do you wear a appropriate labor protection clothing? 4. Do you wear badges and helmet – when necessary? 5. Are the modular group members fulfilling the meetings’ schedules? 6. Is everyone adequately trained in standard procedures? 7. Are tools and parts being stored correctly? 8. Are stock controls being adhered to? 9. Are procedures up-to-date and regularly reviewed? 10. Are activity boards up-to-date and regularly reviewed? • Items are present in aisle ways, stairways, corners, etc.